Phoenix Events UK is back once again in Bedfordshire to bring you our 3rd Annual Bday Bash. This time though we will be kicking it up a few notches!!! Once again we are moving venue, this time to the prestigious UK Centre for Carnival Arts (Luton). 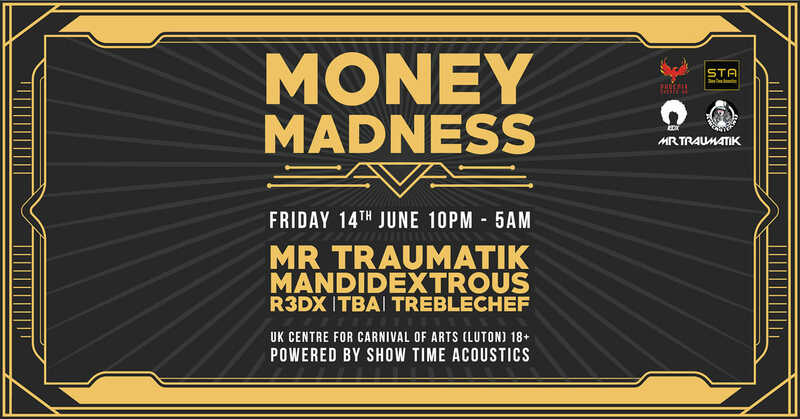 Date / Time: 14/06/2019 Main Room 10pm – 5am, Entrance Room 10pm – 4am. Delve into a world of debauchery and sin. Say hello to the GREAT GATSBY theme. Costume Inspiration as well as costume competition info will be posted soon. BOTH Rooms Powered by Show Time Acoustics who will also be providing a top tier laser show. Be sure to grab your tickets quick whilst they are cheapest!!! Limited group tickets are also available for groups of 5. Our in-house Phoenix Decor team will be transforming the venue for the night to perfectly fit the theme so get involved and dress up!!! Her music combines serious kick bass with amen breaks. Mashing the love of Tekno and Jungle into one massive sound. Invoking a nostalgic feeling on the dance floor with such classic sample selection. She always seems to hit the nail on the head when you are waiting for that one tune or set to take you out of your mind for one second, dancing in a perfect kick bass alternate universe. Well if you are there Mandi is on the decks representing. Named The Jungletek Queen by her fans, Mandidextrous is truly an inspirational producer and performer. The real driving force behind Amen4tekno with all the creative ideas behind the label and the sound. A pioneer in the genre of Jungletek she is a delight to watch on the decks with full throttle energy from start to finish. With an infectious passion for music Mandi has become a well known and followed producer. Not only by music lovers but fellow producers thus forming the Jungletek Mafia. Possessing the power to make dance floors kick off you will rarely find a seated person in the house when Mandi drops her tracks. Over the years Mandi has managed to balance her personal ups and downs with transgender life and focused on putting her emotions into her music. Connecting on all levels to the music and with the listeners. With real fire in her gut and drive in her heart Mandi is leading the Jungletek Mafia to bigger and badder dance floors around the world. Breakbeat was his first love, but from there on out he learned to love the harder side of EDM. Minimal Techno, Psy Trance, Proggressive, Hard trance, quite abit of trance. Drum and bass, filthy, ragga, jump up, all drum and bass. He loves it all, even what some people class as ‘Real music’ . Music is his passion. previously such as Unified Dimensions & No Mercy Events. Bun’nit is no stranger for knowing how to get people moving. Supported acts such as; DJ Luck & MC Neat, Phibes and Blackley. A luton based DJ Duo of “Throbbin Hood” and “8 Legged frequencies”. Their Heavy yet melodic style is a concotion of bone crusing neurofunk, subterranean rollers, melodic liquid and cheeky Jump up that spans the entire Drum and Bass Spectrem. Zodownlo aka Zoe MacKenzie is a jump up/dark d’n’b/jungle DJ from the highlands of Scotland, Found in a bothy in the middle of nowhere 2 springs ago shaking the rafters with all sorts of jump up naughtiness and the rest is history! She made her club debut in Studio 24 2 years back, and has gone from strength to strength, winning Metragnome’s mix competition, playing a collection of festivals from AudioSoup, Elements, Solfest and Shenanigans, and a myriad of outdoors gigs and club nights including Cenote Sounds, Kronik, Too Fast Too Honkin, AberBoomTique, Open Your Mind and Mains Tek Castle Party. She has shared line ups with crazy talented people such as Mandidextrous, Rumble in the Jungle, Kaotik Kartel, Slamboree, Phibes, WBBL, Cenote Sounds, Jamin Nimjah, Lowgrade, Ziggy Gee, Mrs Magoo, Metragnome, Oh My Josh, DemMan Productions, Honkin HiFi, Sir Skanksalot and many many more! STRICT NO TOLERANCE POLICY ON DRUGS. NO THUGS, ALL THUGS WILL BE BLACKLISTED. DRINK RESPONSIBLY AND ENJOY YOUR NIGHT.